MOSCOW (AP) Ten teams have secured spots in the knockout stage at the World Cup , a dozen have been eliminated and 10 still have a chance. With half of the groups finished and the other four groups still playing, here’s a look at who’s in, who’s out and possible scenarios. Uruguay won all three of its group matches, and the Russians won their first two to finish second and move on. Egypt and Saudi Arabia have been eliminated. Spain and Portugal tied with five points each and had the same plus-one goal differential, but Spain won the group because it scored one more goal over the three matches. Morocco and Iran have been eliminated. France and Denmark played to a forgettable 0-0 draw Tuesday in Moscow in the tournament’s first scoreless game , giving France the point it needed to win the group and Denmark the point it needed to make sure it moved on, too. The Danes would have advanced anyway since Australia fell 2-0 to Peru . Australia and Peru were eliminated. Croatia plowed through the group, winning all three games including a 2-1 defeat of Iceland on Tuesday that set up a date with Denmark in the round of 16. Argentina seized the second spot from Nigeria on Marcos Rojo’s 86th-minute strike in St. Petersburg. 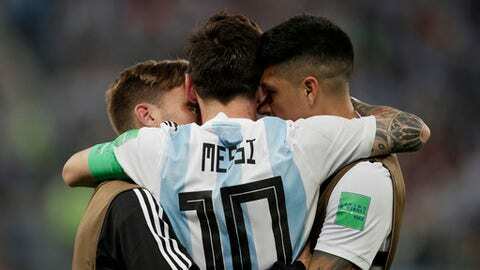 Lionel Messi, who scored the opener, and his teammates take on France in the knockout round. Nigeria and Iceland were eliminated. Brazil and Switzerland have four points apiece, Serbia has three, and any of them could grab one of the group’s two spots in the knockout stage. Serbia meets Brazil on Wednesday, likely needing a win. Switzerland plays Costa Rica at the same time. Costa Rica has been eliminated. Mexico leads with six points but isn’t safe yet. If defending champion Germany defeats South Korea on Wednesday and Sweden simultaneously beats Mexico, three teams would finish with six points. That would send it to tiebreakers that start with the best goal differential. If Mexico and South Korea win, Mexico would top the group and the other three teams would be equal on three points. Belgium and England play each other Thursday to determine which team wins the group and which finishes second. Tunisia and Panama are out of contention.